At the July Eliot Land Use and Transportation Committee meeting Paradigm Properties, along with a designer, architects and a lawyer presented plans for a 8 story building on the corner of 7th and Russell. The packed room, filled with residents from both Eliot and Irvington neighborhoods, universally agreed the building is way too tall and large for that location. Impacted residents have started a petition. Paradigm presented 2 early renditions of what the massive building might look like. Unfortunately nether drawing included existing homes or buildings to get an accurate feel for scale. The entire building will be residential apartments of various sizes rented at market rates. They plan to cover most of the 125′ x 145′ lot with the building with 1 underground parking space per 2 residential units. 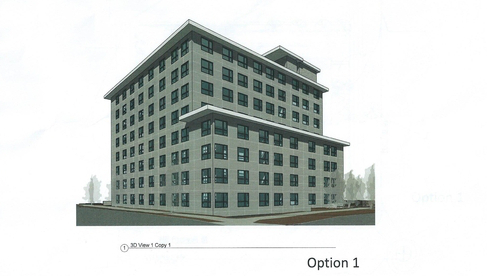 Demand Redesign, a group of residents near the development, has started a petition to convince owner, Dan Neal to scale down the project to an appropriate size. To sign the petition see the link below. Where are all those folks going to park? If I recall correctly in the 90s’ a six story apartment house was proposed there. Too big. That spot is no longer mixed? This proposal is WAY out of scale with the surrounding neighborhood. There simply isn’t anything close to that size for several blocks in all directions. It’s clear that the developer is exploiting an oversight in the zoning of that block at the expense of all the unlucky neighbors. Please sign the petition and let’s put the pressure on him to bring it down to a reasonable size. There are over 800 neighbors that have signed the petition to date. Density is good on appropriate commercial corridors, not on a residential, 2 lane street dominated by single family residences. Leave it as is. Density is a good thing. Not if the 8 story high building was across from where you lived. Like most things, density is good in moderation. This lot currently houses zero people. It was most likely originally plotted in the late 1800’s or early 1900’s to be 3 individual lots of single family homes. Putting 10 – 20 units here increases density and does so in a way respectful to the existing neighborhood. A giant 8 story building is out of place and extreme.